The 511th Parachute Infantry Regiment (511th PIR) was an airborne infantry regiment of the United States Army, first activated during World War II. It formed the parachute infantry element of the 11th Airborne Division. The regiment was formed at Camp Toccoa, GA, in January 1943, under the command of Col. Orin D. "Hard Rock" Haugen. It trained at Camp Mackall, NC, and Fort Benning, GA, and in December 1943 took part in the Knollwood Maneuver. After final examination at Camp Polk, LA, it proceeded to Camp Stoneman, CA, and in May 1944 embarked for the Pacific on the troop transport SS Sea Pike. It trained at Oro-Dobodura in New Guinea until November 1944, when it was sent to the Philippines to join the Battle of Leyte. Its mission on Leyte was to take and hold the passes through the mountains in the center of the island, and engage and reduce the Japanese forces in the area, ultimately in support of the battle of Ormoc simultaneously ongoing. The 511th performed this mission during harsh monsoonal weather in the steep, heavily forested terrain, emerging shortly after Christmas of 1944 onto the Ormoc plain. After rest and resupply the regiment was sent to the island of Mindoro where the 11th Airborne was preparing for its part in the Battle of Luzon. On 3 February 1945 the 511th on board 48 C-47 aircraft performed a combat jump on Tagaytay Ridge. Due to the shortage of planes, the regiment and its associated elements jumped in 3 echelons. Despite some misdrops, the 511th assembled successfully at its drop zone at the Manila Hotel Annex on Tagaytay Ridge and proceeded in battalions north towards Manila, encountering occasional Japanese resistance in the towns of Imus and Las Piñas before engaging the Japanese at the Parañaque River just south of Manila. During the Battle of Manila, the 511th fought through the Japanese Genko Line from 5–12 February, penetrating as far into Manila as the Dewey-Libertad area, before turning east to attack and recapture Fort William McKinley (Fort Bonifacio, now Bonifacio Global City). 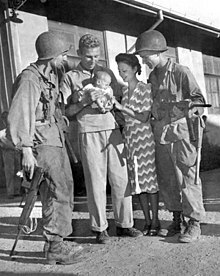 On 23 February its 1st Battalion took part in the Raid at Los Baños, freeing over 2,000 foreign Allied civilians from a Japanese internment camp south of Manila, with its B Company performing a parachute jump on the camp itself. The regiment proceeded to clear a transport corridor from Manila to the towns of Lipa and Batangas City, which has an important port, and took the crossroads town of Santo Tomas. With the rest of the 11th Airborne it also engaged Japanese forces throughout the provinces of Laguna, Batangas, and Tayabas (modern Quezon); the regiment's 1st and 2d battalions in Sixth Army reserve in the towns of Batangas and Bauan, its 3d battalion in active fighting. From 27–29 April it engaged and eliminated the remaining Japanese forces entrenched in underground complexes in the Mount Malepunyo (Malarayat) range east of Lipa. 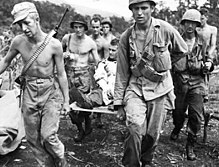 On 23 June elements of the regiment took part in a combat jump on Aparri in northern Luzon, part of the effort to seal off the retreat of Japanese commander General Yamashita. The regiment remained in the Lipa-Batangas area, training for the planned invasion of Japan, until the atomic bombings of Hiroshima and Nagasaki. After the surrender of Japan, the 511th went to Tokyo and then to northern Honshū to perform occupation duty. On 30 August 1945 the 511th arrived by air at Atsugi Air Base near Yokohama to occupy the city and guard the docks from which the peace delegation left to go to the USS Missouri and the signing of the Surrender. On 2 September the Division Band was on hand to greet the debarking 1st Cavalry Division with the strains of "The Old Grey Mare." On 16 September 1945 the 511th moved to Morioka, Japan to begin the occupation of Iwate and Aomori Prefectures in Northern Honshu. In February 1949, the Regiment except for the 3rd Battalion departed Camp Haugen and returned to the United States via the Panama Canal and arrived in New Orleans in March 1949, from where it moved to Camp Campbell, Kentucky. The 3rd Battalion remained in Camp Haugen until April 1949, when it departed for the United States. In March 1956 the 511th (as part of the 11th Airborne Division) crossed the Atlantic into Europe to replace the 5th Infantry Division at Augsburg, Germany during Operation Gyroscope. The 511th was inactivated at Fort Campbell in July 1958. On 1 June 1993, Company A, 511th Infantry was reactivated at Fort Rucker, Alabama to serve as pathfinders by reflagging the existing Company C, 509th Infantry. The company was inactivated in November 1995 and the pathfinder mission discontinued, along with the Air Assault course for which the company provided instructors, due to budget and manpower ceiling cuts. On 1 October 1997, Company A, 511th Infantry was reactivated as a test company for the Enhanced Fiber Optic Guided Missile (EFOGM) system, under the command of Captain Stephen Inouye at Fort Bragg, North Carolina. It was the first and only EFOGM company in the world. On 28 July 2005, Captain Mark Chandler cased the colors during the inactivation ceremony at Rose Field in Fort Bragg, North Carolina. Flanagan, Lt. Gen. E. M., Jr. The Angels: A history of the 11th Airborne Division. 1989 Presidio Press.